The following pictures are high resolution digital copies with 16 million colours to render near photographic quality. There are two available formats for your viewing pleasure: a standard size for fast downloading (click on the thumbnail image to see it) and a large high quality reproduction (click on the link below the thumbnail image). All photographs here are copyright material. If you intend to use my pictures other than for private purposes (ie. without diffusion to the public), please get my permission before doing so (E-mail: [email protected] ). Farm under the Dent-de-Jaman (a tooth-shaped mountain above Montreux). Sheep in pre-alpine landscape (between the Dent-de-Jaman and the Rochers de Naye). Alpine hamlet near Arolla (above Sion) in the canton of Valais. Mountain-path in Säntis area (not far from Appenzell). Geological excursion under snowy conditions in Säntis area (month of June). 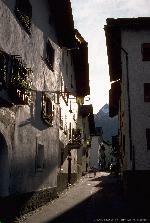 Picturesque village in the canton of Graubünden. Castle in Sion (canton of Valais) - possible future capital of the Winter Olympics in 2006. Colourful sunset over lake Léman from the village of Blonay (above Vevey).